NGC has finalized a deal with prolific coin designer, sculptor and engraver Don Everhart to individually autograph NGC certification labels. Everhart, the last official sculptor-engraver of the US Mint, retired in July. Everhart has been involved in the creation of hundreds of coins, including some of the most memorable US Mint issues of the last decade. 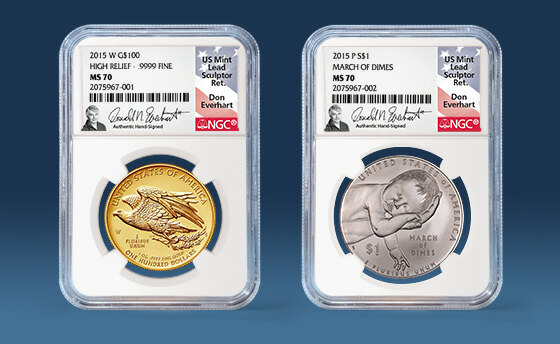 A notable example is the distinctive eagle design that he engraved for the reverse of the 2015-W American Liberty High Relief $100 (the first $100 gold coin ever issued by the United States) and the 2016 American Liberty Silver Medals. Everhart’s work will be prominently featured on the 2018 World War I Centennial Silver Dollar and the 2018 World War I Centennial Army Medal, both of which he sculpted.